It’s no secret. I love coffee. It’s a daily ritual I can’t live without. At home, I tend to stick with my espresso in the morning and drip coffee in the afternoon, but while traveling, anything goes. I’ve enjoyed a steamy bowl of café au lait in Paris, and strong Italian pressed coffee in Venice. I’ve even tasted a good old fashioned percolated cup of Joe in a diner in Tennessee. 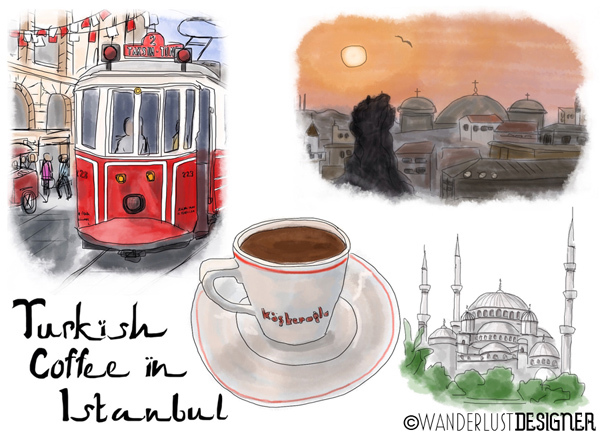 So naturally, when we traveled to Istanbul, I was very excited to try my first Turkish coffee. Of course I knew the taste would be different (all use different types of coffee grounds) but I also found it interesting how different the tastes could be just based on the preparation technique. Turkish coffee is not a kind of coffee, but rather a preparation style. Extremely fine coffee grounds are mixed in a small pot with slightly warm water. Sugar is then added to taste. The grounds (and possible sugar) are not stirred. They are left alone to sink and dissolve into the warming water. As the water gets hotter tiny bubbles or foam form and the brew thickens. The coffee is then stirred, and carefully watched as to not boil. Once the coffee foam rises, it is taken off the heat and enjoyed. Drinking coffee has a long standing tradition in Turkey. It is enjoyed by most at the end of the meal. It is not rushed, but slowly sipped and savored as you engage in conversation and preparation for the next part of your day. After touring the Asian side of Istanbul, my family was driven back over the Bosphorus Bridge and to one of our guides favorite lunch spots. We dined on delicious turkish kebap and at the end of the meal were introduced to our first taste of Turkish coffee. Slowly sipping the muddy brew, I observed the other patrons finishing their meal as well. It was true the coffee was not to be rushed. Gulping down this coffee or grabbing a cup-to-go was definitely not an option. A foreigner may claim it’s because of it’s intense flavor, and/or hot temperature, but it was clear to see as I looked around it was about enjoying your company just a little bit longer before the rest of your day proceeds. What a wonderful concept.